This was a simple sauce to serve with pasta. It was a cinch to make. 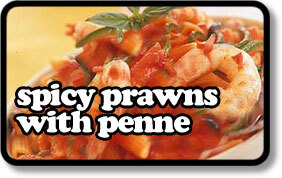 The addition of anchovies to the sauce really lifts the seafood element of the dish. It was extremely moreish and thankfully very healthy! Heat a large pan with the oil over a moderate heat, gently fry the onions and celery for 5-6 minutes until lightly browned and soft. Add the anchovies, garlic, oregano, flaked chillies, salt & pepper and stir for 1 minute. Turn up the heat and add the passata add 200ml water and stir well. Bring the sauce to a simmer, then reduce the heat to low and simmer gently, partially covered for 15 minutes. Add the prawns and simmer for 5 minutes. Remove from the heat. Cook your penne according to the packet instructions. Drain, then return to the pan. Add 2-3 ladles of the sauce (without prawns) and stir into the penne along with the olives and parsley. Ladle into serving bowls and arrange the prawns on top before serving. I never use parmesan cheese when serving seafood pasta. Neither should you!